The Kootenai National Forest has four lookout cabins and three lookout towers available for public rental. These are ideal for visitors seeking remote stays in the forest in a unique back country facility. These facilities are rustic and primitive in nature, and not all are accessible by vehicle, so visitors must be physically fit. More Lookout Tower & Cabin rental information from the Kootenai National Forest web site can be found here! Stay in a Forest Service Lookout Tower or Cabin! The Kootenai National Forest 4 lookout cabins and 3 lookout towers available for public rental. These structures have been used by Forest Service personnel in the past as work stations or lookouts and are no longer being used for active duty stations. They make ideal locations for remote stays in the forest for visitors who are physically fit and would like to stay in a unique back country facility. The views from these lookout towers are spectacular. These facilities are rustic and primitive in nature, located in remote areas. Some are towers several stories tall which require climbing several flights of stairs to reach the top. Others are squattier, story high towers. Lengths of stay are limited to 14 days, some cases less. Access to most of these facilities is typically via a primitive road that requires either a high clearance rugged vehicle or hiking to the site. Permits for use of recreational cabins and lookouts are issued on a first come, first served basis, and may be obtained in person or by contacting the Ranger District having administrative responsibility for the facility of your choice. Advance reservations of a week or more may be required. Lookout towers can accommodate 4 people, cabins accommodate 4-5 persons. Most cabins and lookouts do not have modern conveniences, and electricity and piped-in water are generally NOT available. It may be necessary to bring your own safe drinking water or come prepared to boil or chemical treat water for drinking and cooking purposes. Most of these facilities are not designed for handicapped accessibility. Cabins are generally equipped with bare basics including a table, chairs, wood stove and bunks. Most have mattresses, but not all. Bedding is not furnished. Cooking utensils are available at some cabins, but not all. Recreationists renting cabins and lookouts should be aware that these accommodations are often remote and require navigation skills to get to as well as knowledge of back country travel. Weather snow conditions, personal physical skill and conditioning will all factor in to influence travel time and trip difficulty. Parents are strongly discouraged from bringing children under 12 years of age to lookout towers. People afraid of heights, or lacking physical strength, should also avoid climbing lookout towers. Maps and information about each cabin & lookout are available from the managing Forest Service District Office. Check with them for current conditions before heading out to the cabin or lookout. Swede Mountain Lookout tower is the closest fire lookout to Libby, and one of the few that is accessible all the way to the base by vehicle. 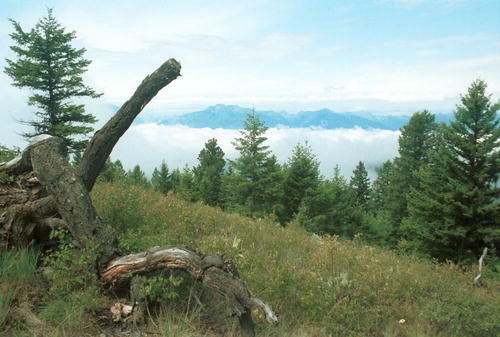 From this lookout the visitor is able to see the Libby Valley, the Kootenai River Valley, and the east face of the Cabinet Mountains Wilderness. 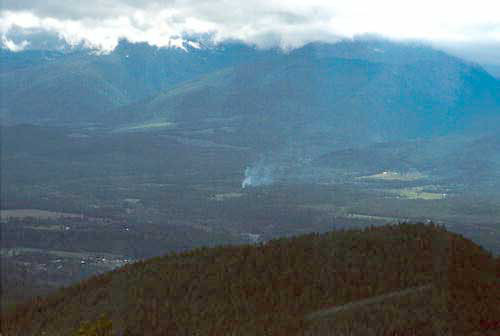 The lookout can be seen on top of the ridge east of Libby from the bridge over the Kootenai River as well as portions of Highway 2 traveling south near Libby. This lookout is still actively manned each year by the Forest Service and is not available for public rental. This is a fun day trip with spectacular views awaiting those at the top. Facilities onsite include a picnic table and outhouse. No water is available. The lookout on duty can usually provide information about the area and fire spotting equipment. Swede Lookout Tower is usually manned throughout July, August and September, depending on the fire season. Outside this period, the gate will be locked, so the visitor will need to park outside on the road and hike a mile and a quarter. Contact the Libby Ranger District office, or Supervisor's Office in Libby to find out if the gates will be open when you wish to visit. Directions: This is a steep, narrow, winding gravel forest road. Sedans can make it going slow, but higher clearance vehicles are recommended. From Libby, travel south 4 miles on Hwy 2. Turn left at Whiskey Hill (steep incline), then right onto the Farm to Market Road. Follow the Farm to Market Road 2 miles and turn left onto Road 533, which will lead to the lookout. The road to the lookout is not well marked, so it is advisable to obtain an accurate map or good directions on which turnoff roads to take to the tower before heading up. available for public rental. Prices subject to change since this page was last updated. restrictions for each particular facility. The lookout can be reserved 3 days in advance of your stay by contacting the Ranger Station or Contact the National Recreation Reservation Service at 1-877-444-6777 or www.recreation.gov, the cabin can be reserved 180 days in advance of your stay. Access depends on weather. Due to tower height, discourage bringing children. No potable water. Vault toilets. 14 day stay limit. 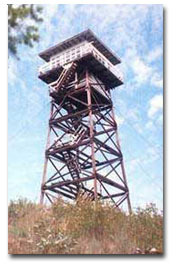 Please visit www.firetower.org for more information about lookout towers that are on the historic register. 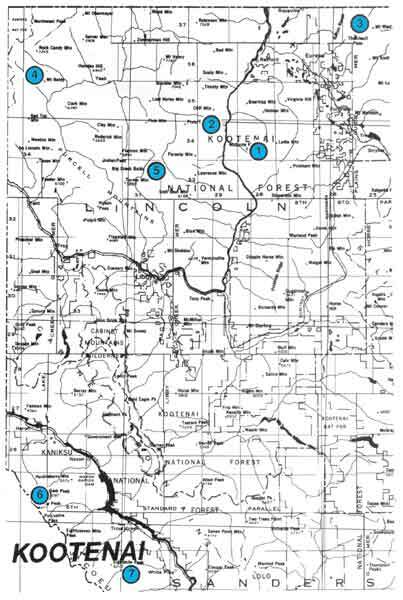 The chart below lists the historic lookouts on the Kootenai National Forest. The ones listed above are still standing and available for public rental. Lookout line art from US Forest Service Lookout brochure.